Queen Beatrix took on the fiery leader of her country’s anti-Muslim party, Geert Wilders, on Thursday by dismissing as “nonsense” his criticism of her decision to wear a headscarf during a recent visit to a mosque. The queen made her unusually forthright comment to Dutch reporters covering her state visit to the United Arab Emirates and Oman. 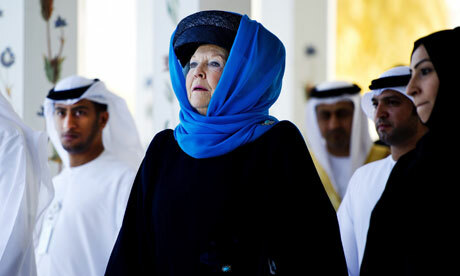 Her comments were not recorded, but Beatrix told reporters she wore the head scarf in the UAE and again on a visit to an Oman mosque to show religious respect. The popular monarch was responding to questions from reporters about parliamentary questions filed by anti-Islam lawmaker Geert Wilders, who said the monarch’s decision to cover her head on a visit to a mosque in Abu Dhabi on Sunday legitimises the oppression of women. It is rare for the queen to respond so directly – and dismissively – to criticism from a political party in the Netherlands, where the unelected head of state’s role is largely ceremonial. Wilders is a staunch opponent of Islamic head scarves and head-to-toe burqa robes for women. He is not alone in his position: the government of the Netherlands has announced plans to ban burqas. Muslims, mostly immigrants from Turkey and Morocco, represent about 1 million of the 16.7 million Dutch population. Prime Minister Mark Rutte on Thursday sprang to the queen’s defence.